Hardwood | PriceCo Floors, Inc. Factory finishing offers many nice advantages. When finished in the factory the product is inspected for defects at the mill so you receive first choice every time. Factory finished flooring usually installs more quickly and prevents the customer from having to deal with many of the dust and odors that are involved with on-site finishing. However, even though factory finished flooring comes in a variety of colors, on-site finishing allows for closer color match with existing woodwork or cabinets. Both factory finishes and on-site finishes are available in either high gloss or matte. Both types have exciting new finishes developed with space age technology and require no waxing. Engineered Hardwood Flooring Prior to the development of engineered hardwood flooring, hardwood products could not be installed on slab or in your basement without a special subfloor system. Now you can enjoy real hardwood flooring in those areas without all that fuss and expense. A special cross-ply construction eliminates the problem of expansion and contraction that is usually associated with solid hardwood. Don’t become overly concerned with thinner or thicker top wood layers associated with engineered products because it’s the finish you are walking on. Generally speaking, you won’t need to re-sand and finish these products. Special considerations when selecting hardwood flooring: *Always buy brand name products *Learn the difference between wood species and their characteristics *Learn what will suite your life style. It is our promise to conduct business in ways that are good to the earth and to the population. We are committed to buying and supplying hardwood that is not only the best quality, but also responsibly collected and ethically traded, in order to created a more stable climate for the future of our planet. We only work with great manufacturers to ensure that our customers have peace of mind. IndusParquet One of our top selling manufacturers of exotic woods is IndusParquet, who offer such styles like Brazilian Cherry, Tigerwood, Brazilian Rosewood and Amendoim. With IndusParquet, there are over 20 different quality control checks your wood goes though before it ever comes into your home. No other exotic manufacturer can say that. We go the extra mile to bring you the best quality. Stop by our showroom to learn more about how this exotic manufacturer is going a step above the rest to make a high quality, long-lasting product. Below Indusparquet shows the layered process of finishing and coating the hardwood flooring: Mirage It is important to point out that not all wood is created equal. Just because you have bought the same species of wood does not mean it was created through the same high quality manufacturing process. For example, you may purchase an inexpensive oak or maple species that will last you five years, but then dent or scratch easily. The process that wood takes through manufacturing is important. Mirage flooring is a manufacturer that we trust to complete that manufacturing process correctly. With Mirage, oak or maple flooring can last you a lifetime, due to their use of the best finishes in the industry. These finishes make their products stronger than any other product on the market. As a Mirage dealer in Laurel, Maryland, we want to show you what Mirage Flooring has to say about their product: “Quality hardwood flooring… the difference stands out!” It’s easy to believe that all hardwood floors are similar, but don’t be mistaken. Only floors that meet the most demanding criteria are recognized as high quality. Before selecting the floor for your project, ask the dealer to open a box in front of you to check for these qualities: Respect for Grade: Make sure the grade you chose with the help of samples is really what’s in the box. Every grade has its own characteristics that help create the look and style you’re seeking. Straight boards of uniform thickness: Lay a few boards on the floor and put them together. They should fit together perfectly and you shouldn’t feel any variation in thickness Small and consistent V joints: When put together, the boards form V joints where they meet. These joints must not be too deep, or dirt and dust can collect and make the floor hard to care for. Uniform finish, even in the joints: The durability of the finish is determined by the quality of the polyurethane and the process used to apply it. The bottom of the joints must also be perfectly coated with varnish or it will collect dirt and water, causing it to darken prematurely. Highest Standard of Finish: Finish needs to be applied in the right amount, not too thin and not too thick, in order to avoid a plastic effect and let the beauty of the wood show through. Consistent color from one box to the next: If the wood is stained, the stain should reach the bottom of the joints to ensure an even floor color. Check that the color is consistent from one board to the next and from one box to the next. UV protection to fight yellowing: Bright light and sun can cause wood from naturally pale species to yellow. UV protection in the polyurethane finish can reduce and slow this process down. Mirage: Guaranteed Peace of Mind. Unmatched Value. Cutting methods There are two main cutting methods for the hardwood portion of an engineered floor. Only the dry sawn method ensures a flawless appearance and the superior quality worthy of Mirage. Dry sawn: Hardwood precisely sawn in desired thickness of plank. Vacuum, sweep or dusts mop your hardwood floor once a week, or more, if needed. The vacuum head must be brush or felt, and a wand attachment is preferable. Do not use the beater bar. Use interior and exterior doormats at entrances to collect dirt & moisture to prevent it from being tracked onto the floor. Area rugs are recommended in front of kitchen sinks, at all pivot points and within high-traffic areas. The rugs must be made of a breathable material to prevent moisture entrapment. Place runners and area rugs (with slip-resistant backings) along high-traffic areas. Keep animal nails trimmed to prevent finish scratches. To prevent surface damage avoid rolling heavy appliances and furniture on the floor. Use plywood, hardboard or appliance lifts, if necessary. Use furniture leg protector pads under all furniture legs. Protect your floor from direct sunlight. Do not use any of the following products (or products similar in nature) on your floor: ammonia based cleaners, acrylic finishes, wax based products, detergents, bleach, polishes and oil soaps, abrasive cleaning soaps or acidic materials such as vinegar. Do not use Steam Cleaners on hardwood floors. This will void hardwood warranty. Do not allow water to stand on your floor for any length of time – wipe up immediately. Do not walk across your floor in poorly maintained shoes with heel taps, spike heels or with any sharp object protruding from your shoe. Do not allow furniture to rest on the floor on small metal tips or hard domes. Do not use rubber, foam back or plastic mats as they may trap moisture and possibly discolor your floor. Do not use vacuums with beater bars or hard heads. Clean up spills immediately with a sponge mop or a soft cloth. Excess cleaner that does not evaporate immediately should be dried with a clean towel. No rinsing is necessary. Using a soft, damp cloth rub the area to remove the stain or spot. Apply water to a clean soft cloth. Rub the area to remove the stain or spot. Apply a sealed plastic bag filled with ice on top of the deposit. Wait until deposit becomes brittle enough to crumble off. After deposit has been removed, clean entire area. Use Touch-Up Kit in smaller areas. Individual planks or strips that are heavily gouged or damaged can be replaced by a professional flooring installer. If needed sanding and finishing may be recommended on a solid floor or engineered floor with a thick enough wear-layer. 1) All woods expand and contract year round. Some woods have less movement then others, therefore, it is important to buy a good quality wood. Solid woods on average expand and contract 10 to 14% per year vs. engineered wood which is closer to 1 to 4%. 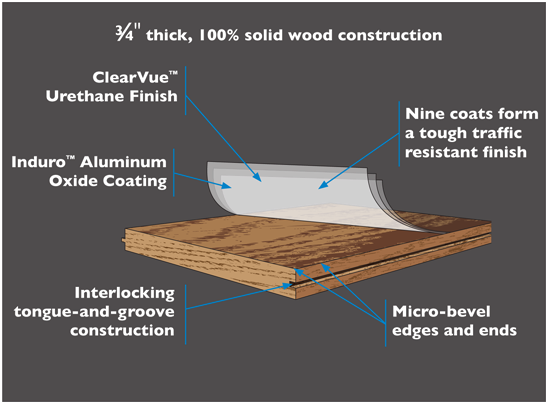 A good engineered wood is a more stable product. 3) With the new aluminum oxide finishes, you probably will never sand & finish your wood. Don’t worry about something that you might do in 20 years. 4) Your house is always in process of expanding and contracting causing gaps between your planks. This is normal and can be fixed easily by using putty. Using putty is an excepted way to cover gaps between planks if needed. 5) Everyone worries about the color of the wood and style matching that of their railings, and so will you. After the job is done, 99% our customer are satisfied with the end result. 6) Wood floors will scratch. They are suppose to. Some scratch less than others and some show scratches more easily than others, but the bottom line is- they all scratch. Even the top-of-the-line quality woods scratch, just look at it as the scratches giving your floor character and personality. The floors will last you a lifetime. 7) Gaps and scratches tend to show a bit more on darker woods and woods with a more unified look (e.g. black colors). 8) Squeaking happens when the subfloor loosens up from the joints due to expanding and contracting. In some spots it is seasonal. This squeaking is normal and a temporary fix is to put nails in the wood to hold it in place. 9) Keep your humidity level 35%-55% year round to avoid major gaps. In the northeast area we experience cold, dry winters and hot, humid summers. If you see gaps don’t worry, it will come back together. Wood is a live product that absorbs humidity and reacts to season just like your house.